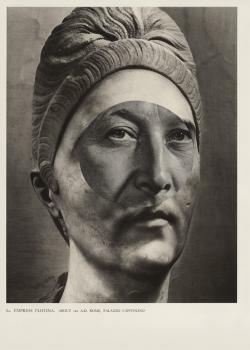 Odires Mlászho’s collages combine two different representations of earthly power as a way of addressing the nature of power’s representation. 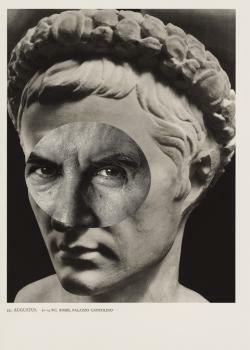 For each work, Mlászho takes an image from Phaidon’s 1945 book Roman Portraits, consisting of fullpage black-and-white photographs of Roman portrait busts, and superimposes cut out eyes from Paul Swiridoff ’s 1960s photographs of German politicians. When printed, the two images lock together almost seamlessly, creating what Surrealist collagist Max Ernst called “a spark of poetry”. 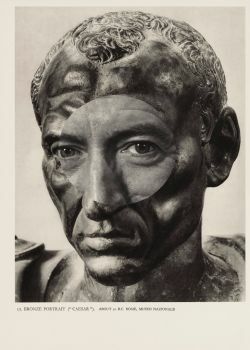 Most noticeable, perhaps, is the manner in which the blank Roman eyes are enlivened, uncannily, by the juxtaposition; as though suddenly cured of blindness, the stone emperors’ heads now glance about furtively, their stoic indifference turned to active and glowering engagement. 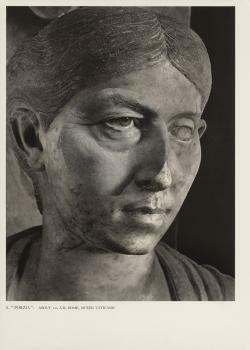 Augustus’s eyes, suddenly beady and glinting, enact this comparison of different ideas of imperiousness: the Roman emperor, a god unmoved by the trivialities of human emotion, is dragged into a modern political sphere of fallibility and corruption. By undermining each images’ claims to authority – the politicians’ eyes are trapped in an unmoving mask of pocked stone – Mlászho ruffles the confidence of power’s images of itself, sowing confusion and ambiguity in the midst of certainty and strength.